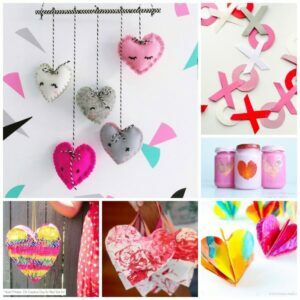 Our Valentine’s Day Crafts series continues. 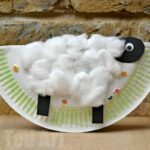 Today, we have the gorgeous Rachel from I Heart Crafty Things, who has a wonderful Heart Paper Plate Sewing Craft for you. 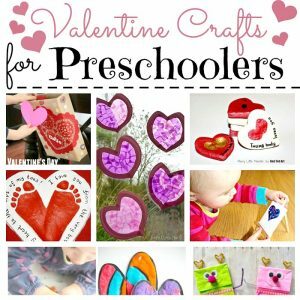 This sewing craft makes a perfect Valentine Crafts for Preschoolers – not only does it look pretty, is EASY, but also is great for fine motor skills developement. 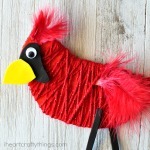 You can’t really “go wrong – the kids can work on this sewing craft whichever way they want. 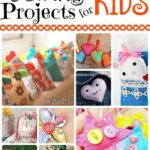 And it is a great introduction to sewing skills for young kids. 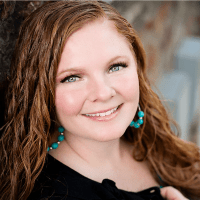 A big thank you to Maggy for having me as part of the 31 Days of Love series again this year! 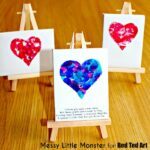 My name is Rachel and I blog over at I Heart Crafty Things where I focus on creating fun and simple children’s arts and crafts. 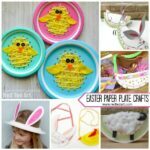 We love creating paper bag crafts, paper plate crafts, cupcake liner crafts and everything in between, so you are sure to find something to love on our site. Please stop by and say hello! This past year we have grown extra fond of using yarn for crafting. 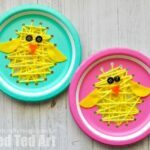 Yarn not only adds a great textural element to crafts, but wrapping, weaving and threading yarn is excellent for kids to learn beginning sewing skills. It’s also great for strengthening fine motor muscles in the fingers and hands. 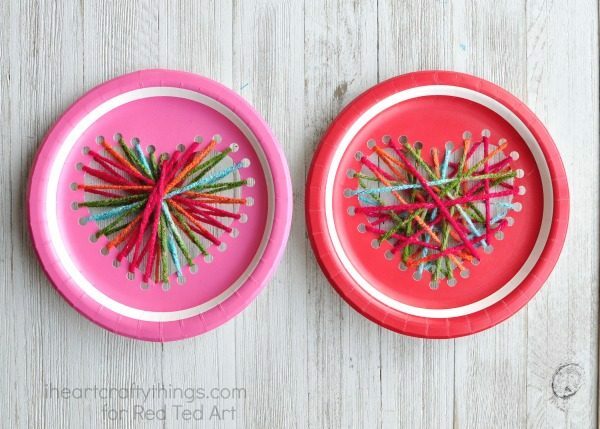 This year for Valentine’s Day we created this paper plate yarn sewing heart craft that your children will adore! 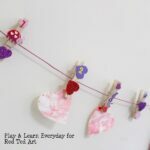 Make one or create several and string them together to make a fun Valentine’s Day banner. 1. 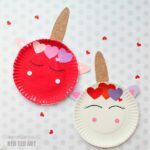 Start by folding a paper plate in half and cutting a heart shape out of the middle of the paper plate for a template. 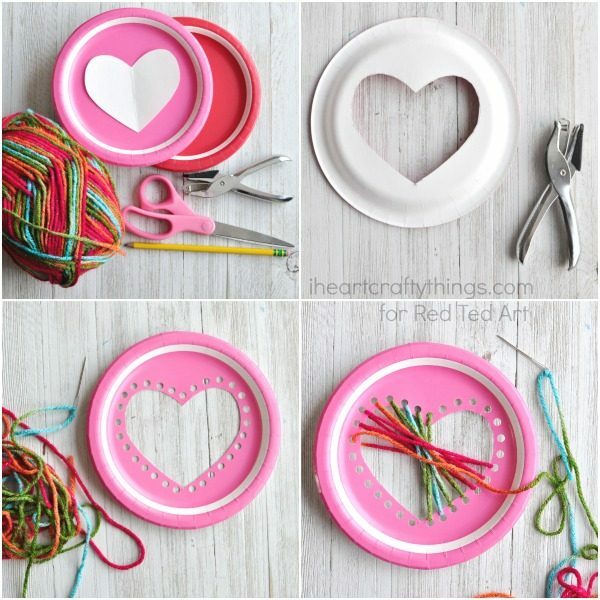 Trace your heart template onto the center of your other paper plates with your pencil and then cut the heart shapes out. 2. Use your hole punch to punch holes around the entire perimeter of the heart. 3. Thread your yarn needle with a long strand of yarn. 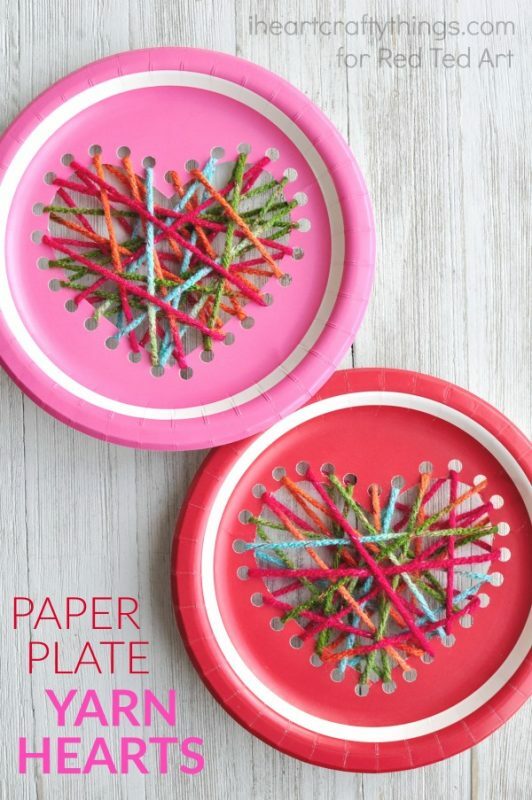 Pull the needle through one of the holes around your heart and when you reach the end of the yarn tape it in place on the back of your paper plate. Now continue threading your yarn around the different holes of the heart until each hole has been used. 4. 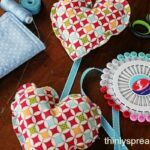 When you reach the end of your yarn or are finished threading through all of the holes of your heart, cut the needle off and tape the end of the yarn onto the back of your paper plate. 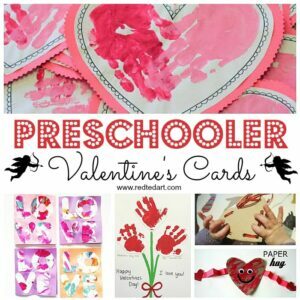 Or why not check out our Valentine’s Day Cards for Preschoolers? 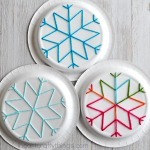 Where can I get a hole punch that can reach the inner part of a paper plate to punch put the holes around the heart shape? When I cut the hole, I punch the the plate from the “inside” so to speak. Does that make sense? Got it thank you!!! If I would have cut the heart out first it would have made sense! Sorry!? What kind of yarn is that? And where did you find it? I really like those colors. Thanks! Normal yarn that you knit with! As to the actual pattern of the yarn… you need to look in your local stores and see what is available – or maybe try amazon? 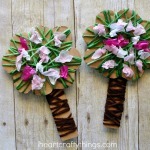 This craft is fantastic! We are going to do this with my daughter’s kindergarten class. How much yarn is needed? Thank you!! Oh we didn’t measure it? So sorry!!! 🙁 enjoy the craft though! Thank you for sharing! 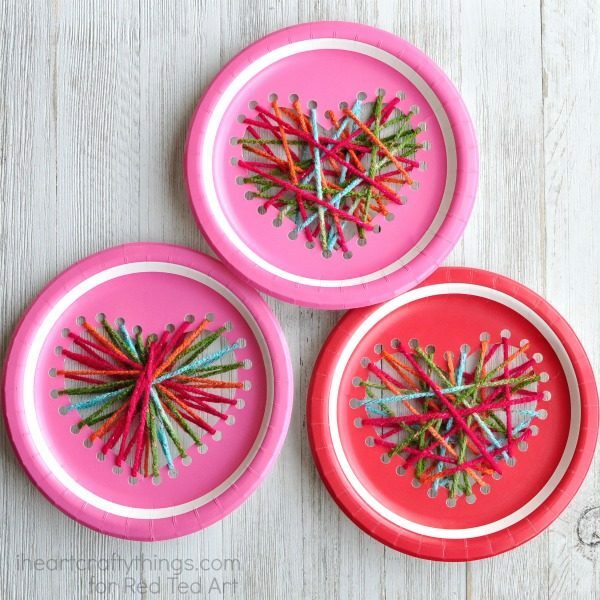 I really like this idea and decided to do this as a craft at my son’s kindergarten v-day party. Since I can not observe all kids, I did not want to utilize needles so I decided to scotch tape the one end tight enough that it acted as the needle. It works perfect!